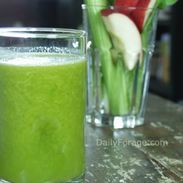 Home » Posts Tagged "green juices"
With this raw, whole food fruit and vegetable recipe not only do you reap the nutritional benefits of fresh juice from broccoli, carrots, spinach and apples, but you’ll also have useable pulp fiber to incorporate into other recipes, boosting nutrition even more at mealtimes. Green juices can be an excellent way to increase your “healthy foods” consumption and get more energy for your busy days. No reason to fear the flavor of this one … it’s gently sweet, bright, and will set your day up right! “Oh! 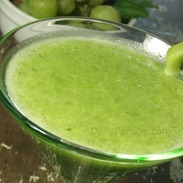 A perfect spa juice!” was the immediate comment from one of my reliable taste testers when I shared this juice. It’s not too sweet, and has no harsh, bold, or bitter notes. A mild, fresh apple flavor is most prominent, with chasings of sweet celery. Though there is plenty of fresh baby spinach, it doesn’t contribute any flavor notes … just a lovely green color … and plenty of iron, antioxidants, and properties that aid digestion. What a smart way to start the New Year! 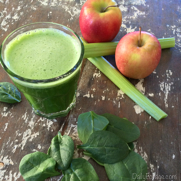 So many nutritional benefits in this juice recipe. 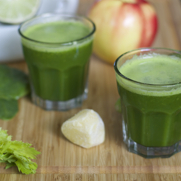 Using my Hurom Slow Juicer, the bold pucker power flavors from combining apples, celery, limes and ginger make it say, “Wake up and start your healthy day”! Our Fruit & Veggie Salad in a Glass juice recipe is naturally gluten-free and dairy-free and tastes just like a mixed green salad with fresh fruit. The combination of oranges, romaine lettuce, celery, and apple provides pure raw food health benefits. Our Green Bloody Mary Mix Juice is BOLD! 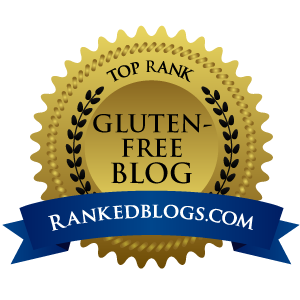 It is gluten-free and dairy-free and requires nothing except Vodka to make it a delicious gluten-free alcoholic drink recipe. We’ve juiced tomatoes and limes, then blended the juice with fresh basil and spinach leaves for all the flavor, vitamins and nutrients a bloody mary mix can provide. Happy Fruit & Veggie Friday, Everyone! How fun is this? 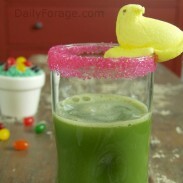 Dressing up our green juice with some Easter adornments of pink sugar and a cheery, bright yellow marshmallow Peeps chick (yep, they’re gluten-free). 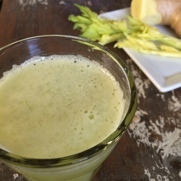 I’ve created this juice with my Hurom Slow Juicer! 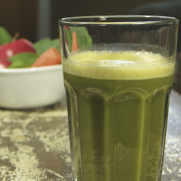 This juice is made of green apples, romaine lettuce and fresh ginger and has a sweet, slightly earthy flavor. 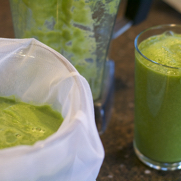 Using our Hurom Slow Juicer, we’ve made a St. Patrick’s Day Green Juice! 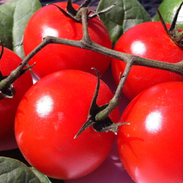 It’s a naturally gluten-free, dairy-free recipe using only the freshest organic fruits and vegetables. And they’re all green too!